Love Italian food? Then be sure to pay a visit to La Brasseria – a beautiful Italian restaurant in the heart of London. Situated on Marylebone High Street, La Brasseria is a favourite to the city’s shoppers, and with breakfast, lunch and dinner menus – La Brasseria is ready to serve delicious food, whatever the time of day! La Brasseria prides themselves on great service and outstanding food – and they are dog-friendly too! La Brasseria has teamed up with Carbon Free Dining, the United Nations-backed Restaurant initiative. They have chosen to demonstrate their love for the environment by partnering with the programme. 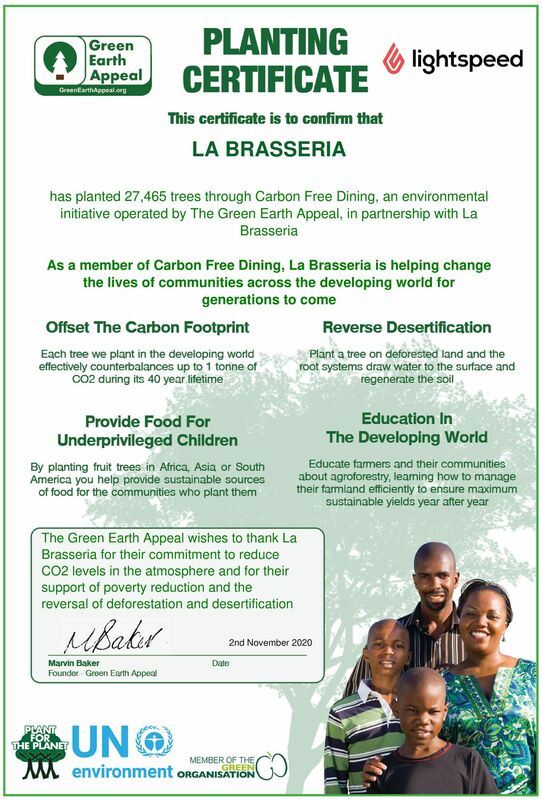 As a Carbon Free Dining Certified partner, La Brasseria plants hundreds of trees each month, effectively offsetting the Carbon Footprint of the meals it serves. This is done by simply giving diners the opportunity of planting a single fruit tree with each bill for an optional 99p.